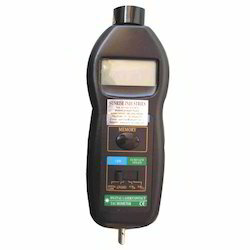 We have gained vast expertise in offering Digital Tachometer with a wide range to our clients, which can be manufactured, exported and supplied at a cost effective price. The tachometer is used to indicate and monitor the speed of rotating machinery like conveyors, crushers, rolling mills, stirrers and etc. These are fabricated using an extensive quality material and well known for its features durability, high performance. We present an exclusive range of Digital Tachometer to our clients. These are contrived using best grade raw materials and advanced technology, which ensures less time and power consumption while functioning. Our offered ranges of these machines are appreciated for its features like duality, high performance. These are used for to indicate and monitor the speed of rotating machinery like conveyors, crushers, rolling mills, stirrers and etc. (Liquid Crystal Display), with function annunciation. 2.5 to 99,999 RPM (r/min). 0.1 RPM (2.5 to 999.9 RPM). 1 RPM (over 1,000 RPM). 0.8 sec. (over 60 RPM). Max. value, Min. value, Last value.